After another successful showing at the Enterprise Connect expo, the team has packed up the stand and is gearing up for the Channel Partners Conference and Expo taking place in Las Vegas next month. This was the second year in a row that Zailab exhibited our cloud-based contact center solution at Enterprise Connect. Last year we turned heads by parking the ZaiTruck right inside the Gaylord Palms to entice visitors to our stand, and this year the industrial design team did it again with The Lander, a larger-than-life spacecraft installation designed to offer visitors a truly immersive audio-visual experience. 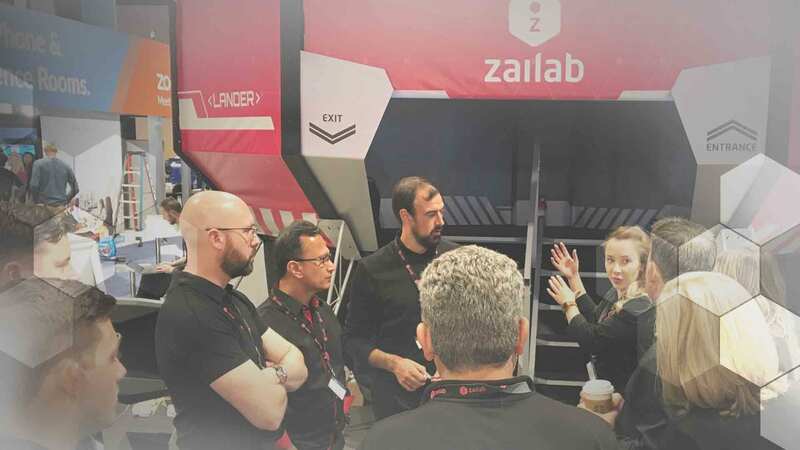 But while visitor interest may have been piqued by The Lander, the true attraction at the Zailab stand was our CCaaS offering, which delegates wasted no time in trying out. Our demo station became a focal point as visitors took turns to create their own contact centers, design their ideal IVR flows and check out the omnichannel features offered by our platform. We asked some of the team for their top highlights from the event. Our Channel Director for the Central region, Forrest Knueppel, says his personal highlight was seeing so much enthusiasm for the product from visitors and hearing their excited responses after demos. SVP of Sales Michael Cibelli echoes this sentiment. ‘The number of potential partners who came back to our booth with more people – to show them what they had learned, and their excitement for the product – was really exciting,’ he says. It was not just visitors and channel partners who were excited about what they saw. ‘Another highlight was seeing one of our investors jump into the system for the first time and build their own workflows on the platform, which they could then demonstrate to others. That is a testament to the usability and intuitive nature of our platform,’ says Forrest. It seems the general consensus from the team was the sheer excitement from visitors to the stand. Unlike other exhibitors, every detail that went into the Zailab stand was designed in-house. From the construction of The Lander and stand design to the AI algorithm that drives our Single Waiting Room, it was a group effort from start to finish. According to Channel Director Spencer Parikh, those efforts were reflected in the overwhelming sense of comradery evident at our stand. ‘I noticed there was a lot of pride and passion when doing demos. It also naturally came out around our company story,’ he says. For our newest Channel Director Dave White, responsible for the Northeast region, it was the perfect introduction to the company and a solid affirmation for joining. ‘It was a tremendous opportunity to get something special off the ground and in the air, with everyone rowing in the same direction,’ he says. Watch the video highlights from Enterprise Connect now. Read more about The Lander here.